The presentation of the marLED® X was a special highlight. marLED® X is the new operating light that we presented to the public for the first time at MEDICA 2018. Under the slogan "marLED® X is Xtremely different", the operating light represents innovative lighting technology that meets a variety of operating situations, tissue types and user needs, while being extremely easy to use. Further novelties were the reusable sealing instrument marSeal5 plus Maryland or innovations in the field of our sterilization containers microStop® and marSafe®. 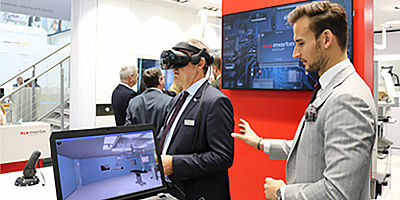 Product presentations in Virtual Reality (VR) and Augmented Reality (AR) allowed visitors of the fair to experience our products in a new and interactive way. For example, when looking into the virtual reality glasses, the visitor was led into an artificial reality: an operating area. This corresponded to a typical spatial planning according to the marWorld® concept. In this virtual room, the visitor was able to move freely and to explore in detail the different rooms, such as the operating theater. In addition, the visitor was able to configure his own individual operating room. For example, he was able to design doors and walls according to his own ideas. Furthermore, the microStop® and marSafe® sterilization containers were brought to life via augmented reality. The real trade fair environment was virtually expanded by the sterilization containers. The visitors were able to operate the containers via the tablet.